The great works of the masters of the Romantic era, energetic contemporary pieces and a unique combination of string and marimba sounds ‒ another concert in the new cycle "Sinfonietta po krakowsku" is a real treat for music lovers. 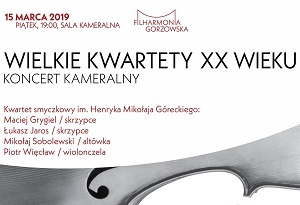 The event will take place on March 20, 2019 at 8.00 p.m. in the concert hall of the Kraków Philharmonic. 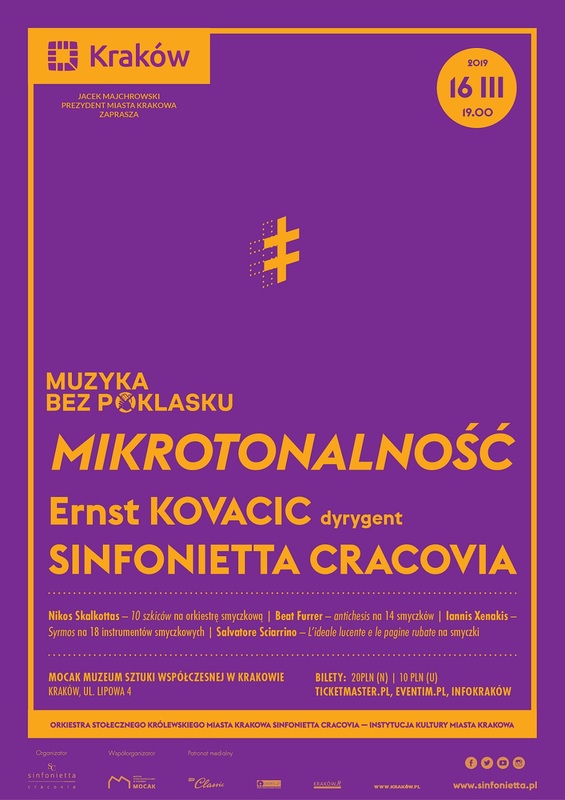 "Sinfonietta po krakowsku" is a cycle in which Sinfonietta Cracovia promotes the most talented young artists from Kraków. This time the ensemble will perform under the baton of Jurek Dybała with Jakub Frączek, the laureate of the competition "I play with orchestra" organized by the Academy of Music in Kraków. 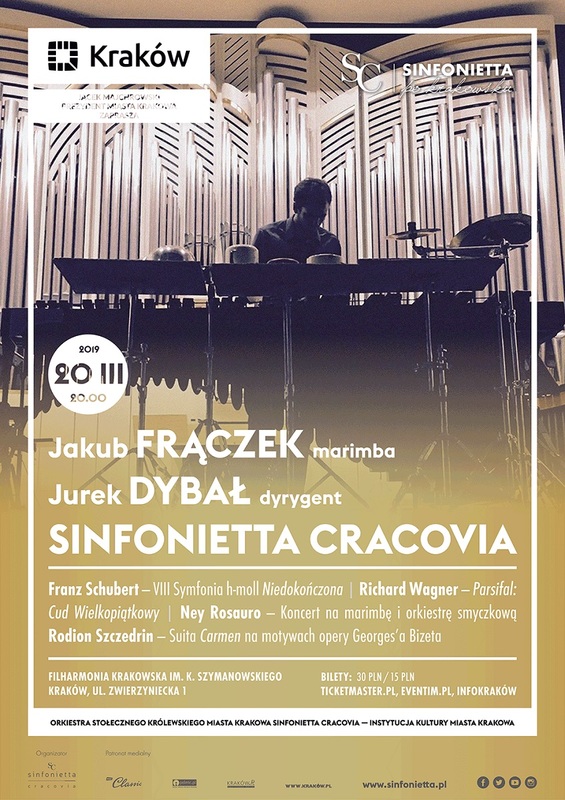 The marimbist will perform with Sinfonietta Cracovia a virtuoso, thrilling Concerto for marimba and string orchestra by Ney Rosauro ‒ the most popular composition for this instrument in history, extremely appreciated by music lovers and critics around the world. We will also listen to Franz Schubert's famous Symphony No. 8 in B minor "Unfinished" and the third part of the Richard Wagner's opera Parsifal, immersed in the fairy-tale world, in which the Christian mystery meets the convention of a medieval epic about the Holy Grail guardians. The evening will end with the extremely popular Suite "Carmen" from the famous opera by Georges Bizet in the arrangement of the Russian composer Rodion Szczedrin dedicated to his wife, the prima ballerina of the Bolshoi Theater, Maja Plisiecka. Both organ and percussion are instruments that impress with their sound possibilities as they possess many colors, textures and shades. Album Patmos. Music for organ & percussion (UMFC CD 109) is the first recording of its kind on the Polish phonographic market. 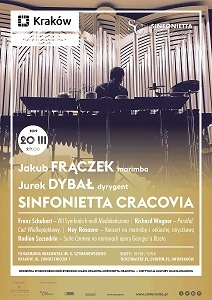 The premiere will take place on March 20, 2019 at 7:00 p.m. in the concert hall of the Fryderyk Chopin University of Music. Pieces for organ and percussion are not often performed in Poland, which meant for the artists – Bartosz Jakubczak (organ) and Miłosz Pękala (drums) – additional motivation to create a project that would show four different musical ideas for such set of instruments. In addition, the CD includes Letter from faraway Island for organ and percussion (2018) by Aleksandra Chmielewska, specially written for the album. 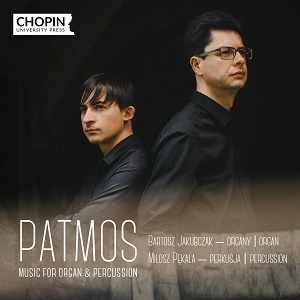 The motif of the Patmos island in Chmielewska's composition refers to the Landscapes of Patmos by Petra Eben, hence the title of the album. A creative input to the repertoire concept includes the works by Christopher Dean – Mourning Dove Sonnet, Magdalena Białecka – Landscape in White (premiere), Thierry Escaich – Ground II, and Marek Jasiński – Psalmody (world phonographic premiere). 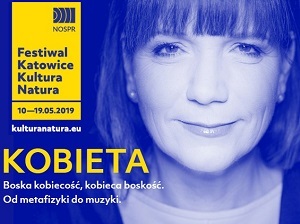 The Mayor of the City of Katowice Marcin Krupa and the General and Programme Director of NOSPR Ewa Bogusz-Moore would like to invite you to the fifth edition of the Festival "Katowice Culture Nature: Woman", which will take place on 10-19 May 2019. Tickets for the concerts available at the box office and in the online sales system from 1 March 2019. Every year, the programme of the Festival is open to all musical periods and genres and bound to host world-class ensembles and soloists who are certain to deliver performances on the highest level. Traditionally, the Festival will open with a subscription concert of the Polish National Radio Symphony Orchestra led by Alexander Liebreich. They will present a rarely performed piece by Arthur Honegger, Jeanne d'Arc au bûcher, devoted to one of the most famous women in world history. NOSPR will also perform on 16th May. Together with special guest Zbigniew Zamachowski, they will present pieces by Tchaikovsky and Berlioz, as well as Stravinsky’s Oedipus rex. In two concerts, on Friday 17th and Saturday 18th May, the Festival will feature one of the best Austrian orchestras: Mozarteumorchester Salzburg and its artistic director Riccardo Minasi. During the Saturday concert, the orchestra will perform with Luisa Imorde, a renowned pianist. 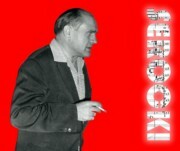 12th May will see the performance of one of the best Russian pianists, Nikolai Lugansky. On Tuesday 14th May, the highlight of the Festival’s liederabend will be the performance of a world-famous British vocalist, Dame Sarah Connolly accompanied by Joseph Middleton. 19th May will see another of the Festival’s highlights – the concert of the famous London Philharmonia Orchestra led by the wonderful Alondra de la Parra. The evening will feature Jean Sibelius’ Violin Concerto in D minor Op. 47 performed by an absolute world star of the violin, Viktoria Mullova. As it was the case with previous editions, the Festival will also play host to jazz concerts. On 11th May, a rising star of global jazz vocal scene, Youn Sun Nah from Korea, will perform in the concert hall. On 13th May, there will also be an occasion to listen to chamber music performed by the Silesian Chamber Orchestra led by Robert Kabara. The programme will include works by Hanna Kulenty, Eugeniusz Knapik, and Erich Wolfgang Korngold. 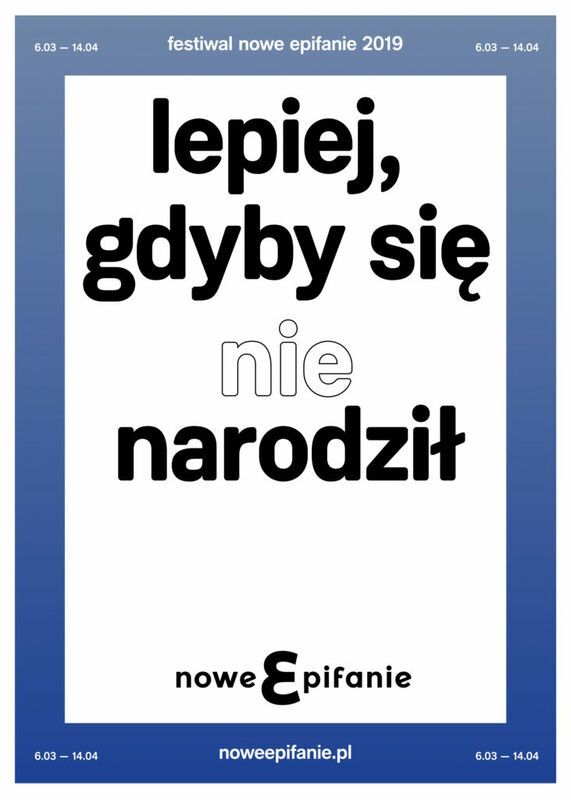 Warsaw | 10th Interdisciplinary Lenten Festival "The New Epiphanies"
On March 6 −April 14, 2019, the 10th Interdisciplinary Lenten Festival "The New Epiphanies" will take place in Warsaw. Better if he was not born? At first, Judas was only an addition to us, a biblical exemplification of the subject of money, consumption and betrayal. But he dominated our thinking very quickly. Why did he depart from what he believed in? What were his motivations? Why are there different versions of the events? There are five theater premieres ahead of us. Bartosz Żurowski and Dawid Zalesky will present contemporary revisions of the history of Judas. The spectacle #chybanieja, which will open the festival's theatrical discussions, was made by the duet Paweł Passini and Artur Pałyga. In their performance, Judas's story seems to run throughout contemporary situations of betrayal like a silver strand. Paweł Passini is also the author of music for this play. The festival also includes film, culinary and music events. On March 30 at 4.00 p.m. in the Temple of Divine Providence, the "Gloria Patri" concert will take place – a tribute to John Paul II on the 14th anniversary of his death. 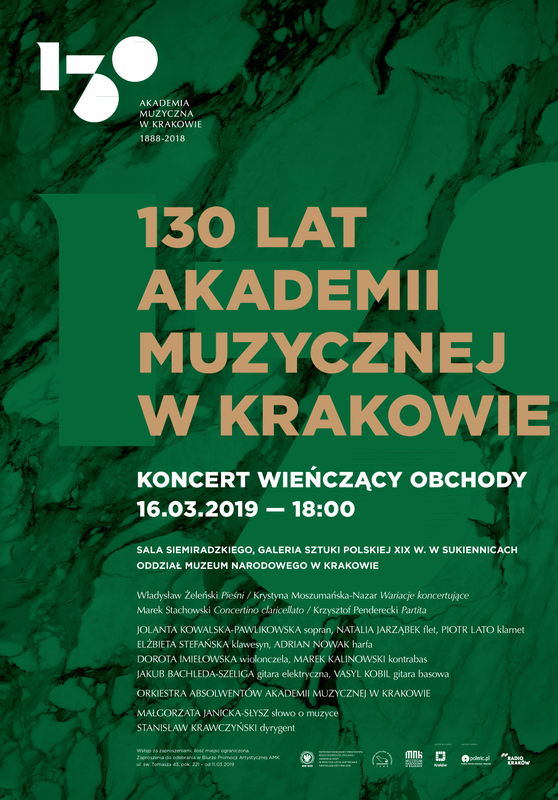 We will hear eleven Warsaw choirs from academic and church environments that will perform, among others, works by Jakub Neske, Janusz Dąbrowski, and Michał Dąbrowski. There will also be the premiere of Gloria Patri polychoral work by Paweł Łukaszewski, which was composed to the words of doxology. The concert will close with the composition of Zuzanna Falkowska to the words of John Paul II given at the Victory Square in 1979 – Let Your Spirit Descend. This year's Classical Music Gala and the presentation of "Fryderyk" Awards were held in the Polish National Radio Symphony Orchestra Concert Hall in Katowice on March 12, 2019. Most of the statuettes – in the categories of "Choral Music, Oratorio and Opera Music", "Early Music" and "Contemporary Music" – were awarded to musicians associated with the Witold Lutosławski National Forum of Music in Wrocław. In the Year of Stanisław Moniuszko, the album Stanisław Moniuszko. Phantoms performed by the NFM Choir and the Wrocław Baroque Orchestra under the direction of Andrzej Kosendiak, received a "Fryderyk" award in the first category. Best album in the "Early Music" cateogry is Marcin Mielczewski II Wrocław Baroque Ensemble under Andrzej Kosendiak. 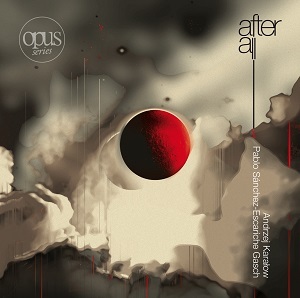 In the "Contemporary Music" category the winner is the Supernova album by Atom String Quartet, NFM Orchestra Leopoldinum and Christian Danowicz, featuring works by Hanna Kulenty-Majoor, Mateusz Smoczyński, Dawid Lubowicz, Michał Zaborski, and Krzysztof Lenczowski. The award for the best album with solo recital went to Janusz Wawrowski and Jose Gallarda for Hidden Violin, presenting works of Henryk Wieniawski, Grażyna Bacewicz, Ignacy Jan Paderewski, Ludomir Różycki, Mieczysław Karłowicz, Witold Lutosławski and Karol Szymanowski. "Fryderyk" in the "Chamber Music" category was awarded to the album Giovanni Battista Pergolesi "Stabat Mater" / Paweł Łukaszewski "Luctus Mariae", released by the Chopin University Press. In the category of "Symphony and concert music", the award went to Błażewicz, Łukaszewski and Czarnecki. 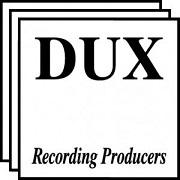 Polish Contemporary Concertos, released by DUX. The Silesian Quartet received the statuette for the most outstanding recording of Polish music – The Silesian Quartet and friends. Grażyna Bacewicz. In addition to the statuettes in the eight main categories, two "Golden Fryderyk" Awards were given for lifetime achievement to conductor Jacek Kaspszyk and jazz vocalist, composer and poet Wanda Warska. 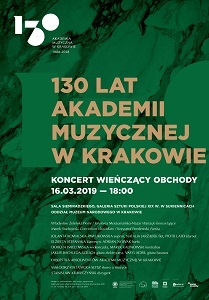 With a concert on March 16, 2019 at 6:00 p.m. in the Siemiradzki Hall in Kraków Cloth Hall, the Academy of Musica in Kraków will close the celebrations of its 130th anniversary. The programme of the jubilee concert will consist of works by artists associated with the Kraków Music Academy since its inception. 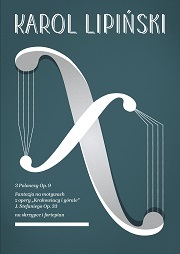 We will listen to compositions by Władysław Żeleński – founder of the Conservatory of the Music Society in Kraków, creators associated with the Academy of Music nowadays as well as its former rectors: Krzysztof Penderecki, Krystyna Moszumańska-Nazar and Marek Stachowski. The concert will be attended by a group of university graduates and the Alumni, Teachers and Students Orchestra. 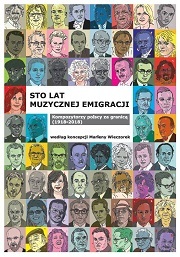 The evening will be hosted by the current rector, prof. Stanisław Krawczyński. Małgorzata Janicka-Słysz will say a few words about the repertoire..  Invitations are available at the Art Promotion Office at 43 St. Tomasz Street (room 221, second floor), between 8.00 a.m.–3.00 p.m..
What are the mysterious microtones? Why is microtonal music so different from the one we arre used to as listeners of European classical music? The answers to these questions will be sought together with Sinfonietta Cracovia on March 16, 2019 at 7.00 p.m., during the next edition of the cycle "Music without applause" at the Museum of Contemporary Art MOCAK. On March 16, Jurek Dybała's ensemble will perform under the baton of the outstanding conductor Ernst Kovacic, with whom they inaugurated this innovative series four years ago. We will listen to microtonal compositions, based on musical intervals smaller than a semitone. In modern European music, microtones appeared only thanks to the modernists and avant-garde artists. It is worth mentioning that it was the forgotten, unequal temperament that was characteristic of the musical culture of ancient India, China, Arab countries and Greece. It is not without reason that the concert will start with the precursory experimental works of 20th-century Greek composers: bravura and dynamic 10 sketches for string orchestra by Nikos Skalkottas and dramatic Syrmos for 18 string instruments, in which you can feel the mathematical precision and spatial imagination of the composer and architect Iannis Xenakis. The raw space of the Museum of Contemporary Art MOCAK also enables to reach for the latest music, which will be represented by the economical and moving antichesis for 14 strings by the Austrian composer Beata Furrer. The evening will end with a Polish premiere of L'ideale lucente e le pagine rubate for strings by the Italian composer Salvatore Sciarrino, one of the most renowned and most frequently awarded contemporaries. According to the rules of the cycle "Music without applause", listeners will be asked to refrain from applause both during the concert and after its end. So far, this unusual postulate has been successfully implemented – will it work out this time? 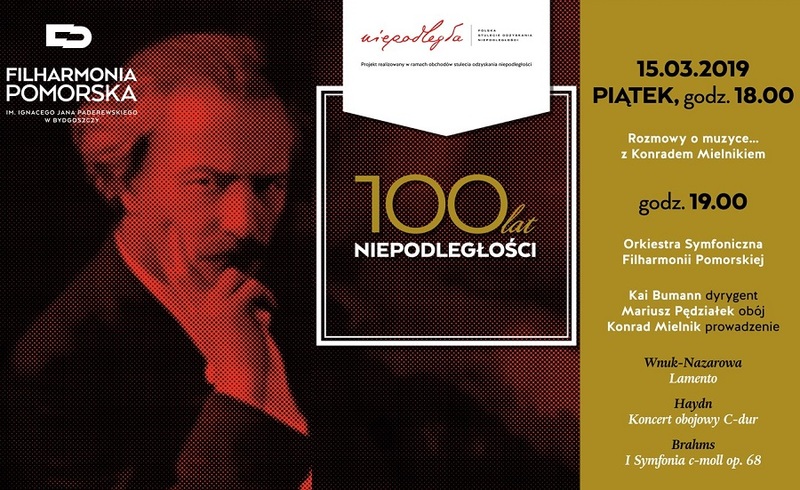 On March 15, 2019 at 7:00 p.m., the Ignacy Jan Paderewski Pomeranian Philharmonic in Bydgoszcz will host a concert entitled "100 Years of Independence". The evening will start with the performance of Lamento for the oboe by Joanna Wnuk-Nazarowa. 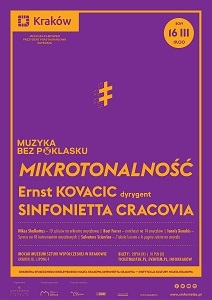 The Symphony Orchestra of the Pomeranian Philharmonic under the baton of Kai Bumann will perform together with Mariusz Pędziałek – a concertmaster of the Cracow Philharmonic Orchestra, who is also a member of the Artistic Society "Muzyka Centrum", the Polish Society for Electroacoustic Music, the Witold Lutosławski Society, and the Brass Quintet of Kraków Philharmonic. He has performed many times at the "Warsaw Autumn" festival, he was also a member of the Program Committee of the "Poznań Spring" Festival. During the concert in Bydgoszcz, Mariusz Pędziałek will also present his rendition of the oboe parts in Joseph Haydn's Concerto in C Major, which score was discovered and released only in 1926. In the finale, we will listen to the Symphony No. 1 by Johannes Brahms. Before the concert, at 6.00 p.m., there will be a meeting with Konrand Mielnik – music producer and journalist, artistic director and head of the Editorial Board of the Culture Office of the Polish Radio in Gdańsk – Radio Gdańsk S.A.
On March 15, 2019 at 7.00 p.m., the Gorzów Philharmonic will host a concert of the Henryk Mikołaj Górecki String Quartet. The programme will consist of string quartets by Karol Szymanowski and Witold Lutosławski. The genre itself was not one of the most popular in Polish music until the 20th century. Karol Szymanowski was the first composer who applied creative and original ideas ​​to the traditional form of string quartet. 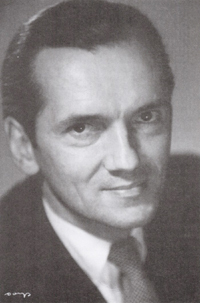 Thanks to him, this form has become a fertile ground for creative explorations for other outstanding Polish composers. Szymanowski's String Quartet No. 2 is one of the most "modern" of his compositions. It comprises the elements of expressionism, impressionism, neoclassicism, and romantic emotionality. The individual features of the composer's style can be found, among others, in references to highlander folklore. Witold Lutosławski's String Quartet reflects the "storm and stress" period in the composer's output. It is distinguished by avant-garde, slightly aggressive sound, which stems from the ad libitum technique, and the two-part form. Gdańsk | Premiere of the "Chemistry of Love" album as part of the "Neo Concept"